Newroz in Turkey: What symbol for tomorrow? Tomorrow, on the 21st of March, the spring equinox, is celebrated Iranian and Kurdish New Year, Newroz (in the Kurdish Kurmancî dialect). In Farsi the meaning of the word translates into “new day”1: it is a celebration of life towards a productive new year. Traditions regionally vary, however dances, jumping fire and food are core activities of Kurdish celebrations. Newroz is celebrated in Iran, in the Kurdish areas Iraq, Turkey and Syria, and in Afghanistan, Tajikistan and Azerbaijan, amongst others2. In which circumstances will Newroz take place in Turkey this year? Turkey has been subject to a lot of upheaval this last year. Between two key elections in 2015, terrorist attacks in Ankara and Istanbul, the war in Syria, the end of the ceasefire with the Kurdish armed group PKK and Erdogan’s “New Turkey” policy, relations between Ankara and its Kurdish community have worsened. Newroz is a key symbol in the relations between Kurds and the Turkish government. While in 2012, the celebration was marked by important clashes between the police forces and the ones celebrating, Newroz 2013 was full of hope for peace. How did it become not only a cultural, but a social and political symbol? We would like to examine how the celebration has been instrumentalized throughout the years in the relations between Kurds and the Turkish State, and what it implies for tomorrow’s celebration. The origins of this celebration are found in ancient Mesopotamia. Kurdish Newroz is built on the legend of Kawa the Smith, which was put forward by Kurdish intellectuals in Istanbul during 1918-19193. It is suggested that the legend was considered a symbol of resistance, contributing to the shaping of a separate Kurdish nation. Celebration of this day and other cultural practices intensified along with growing political activities of left-wing Kurdish parties. Indeed, since the establishment of the Republic of Turkey in 1923, strong Turkish nationalism4 and policies have been implemented “on the grounds that there is no relationship between biological characteristics and social traits”5. 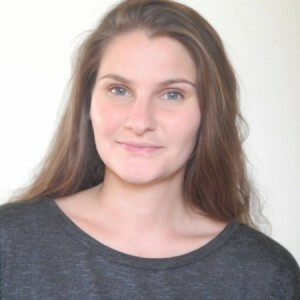 It implied strong cultural and social reforms denying other existing cultural or ethnic identities present on the territory, and forcing westernization through a deep secularization of the country6. In this atmosphere of violent repression, authoritarian practices led to uprisings and discrimination against Kurds, who organised to better mobilise. The nationalist intelligentsia, along with traditional tribal chiefs7, and leftist movements, joined their efforts for the Kurdish cause. The strong mobilization and organisation around the Kurdish cause gave space for the emergence of Partiya Karkerên Kurdistan, the Kurdistan Workers’ Party more commonly known as the PKK. Considered as terrorists, Kurds’ representative or freedom fighters, the non-state armed group PKK was officially created in 1978, having as a main objective “[the establishment of] a Kurdish state after carrying out a successful communist revolution”8. 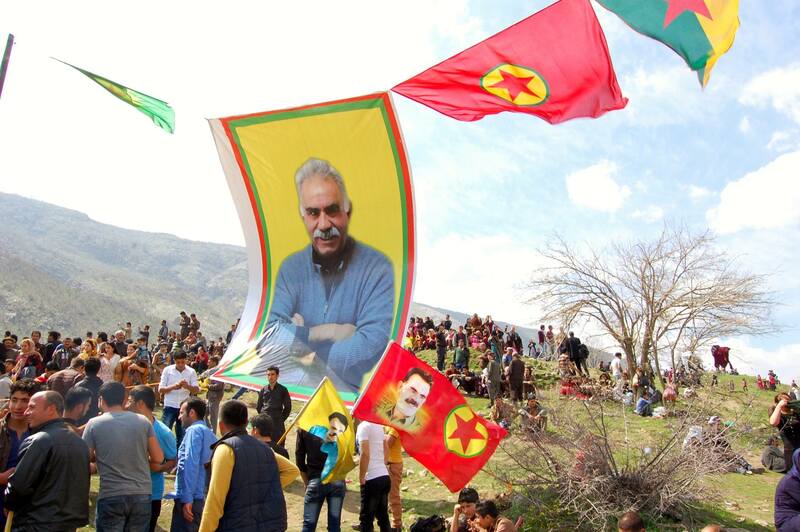 The man at the root of PKK is Abdullah Öcalan, still seen as a symbolic figure for the fight of the Kurdish cause today. The Turkey-PKK war has killed more than 40,000 people since its start, and keeps destroying the Eastern part of the country and driving people to flee as we speak9. From both sides, the strategy, mobilization and violence used have been changing and evolving throughout the years, and Newroz played a key symbolic instrument in this endeavour. During the 1980s, the Kurdish cultural identity in Turkey was strongly reinforced when the PKK intended to create a unification of the Kurdish population within the country. To this end, Newroz quickly became an important feature in the agenda of constructing a cultural unity for political means. In fact, the writing of the word with a W in Kurdish instead of a V in Turkish is a symbolic stance considering the W letter does not exist in the Turkish alphabet10. Up until the Turkish coup in September 1980, Newroz was not an overall celebrated tradition amongst Kurdish population in Turkey11. At that time, Öcalan, leader of the PKK, and the party changed the symbolic around the celebration of Newroz in Turkey12. Although it was already considered as a representation of the fight of Kurdish people for resistance and individualization, it became an active political tool and a “symbol of national identity building”13. This was carried on by one of PKK’s sub-fronts, the New Front for the National Liberation for Kurdistan (ERNK), in charge of capabilities mobilization and the political development of the organization, throughout exposed activities during Newroz celebration14. As Turkish-Kurdish relations became highly tensed, celebrations of Newroz were banned by Ankara at that time15. The PKK utilized (up until today) the 21st March to raise awareness and funds for the Kurdish people and its activities16. The cultural celebration was then at the center of the political discourse17. Turkish Nevruz, to what end? Although the PKK grew and gained popularity during the 1990s, its combat forces had been strongly weakened by the Turkish Army. The PKK had to withdraw its base from the country, while initiating violent attacks targeting non-combatant civilians in any urban areas, public sites, or touristic locations18. These terror attacks were soon accompanied by kidnapping19 and suicide bombings20. In response, Ankara led a double offensive, fighting PKK by targeting its base in Iraq, and developing national policies to maintain control over growing Kurdish separatism. Newroz was perceived as a cultural day that encouraged this tendency21. Ankara took a stance by declaring Nevruz as Turkish celebration. In 1991, the Ministry of Culture of Turkey instated the 21st March as an official holiday22. The spelling Nevruz was chosen to fit the Turkish language. Turkish officials, academics and religious entities developed arguments to justify the celebration of Nevruz, in particular by using the myth of Ergenekon23. However, there was little unanimity in adopting Nevruz as a Turkish tradition within the academic Turkish community, even though it was previously celebrated during the Ottoman period24. This “invention of tradition”25 is considered as a perfect example of the use of culture to a political end. Turkish officials, advocating the promotion of social cohesion, stressed that “Nevruz celebrations will erase hatred and animosity. Nevruz will bring the unity and harmony that we are longing for”26. However, this policy fulfilled various political agendas. As the Soviet Union had crumbled down, Turkey was attempting to develop and concede economic and political ties with former soviet Turkic republics, such as Azerbaijan or Turkmenistan, who traditionally celebrated Newroz27. It was also a way to counter the active use of Newroz by the PKK28, by allowing only official Nevruz celebrations to take place on that day. Obviously, this political move was not unanimously well received within the Kurdish community. During the early 1990s, the PKK would not recognize the official Nevruz celebration29, and led to violent clashes. 1992 was one the deadliest Newroz/Nevruz celebration with over 60 people killed in clashes with the Turkish security forces30. In continuation of the 1990s, repressive measures and violence towards Kurds would regularly be used by the Turkish police forces to counter the unofficial Newroz celebrations. The level of violence was and is heavily influenced by the state of PKK-Ankara relations. 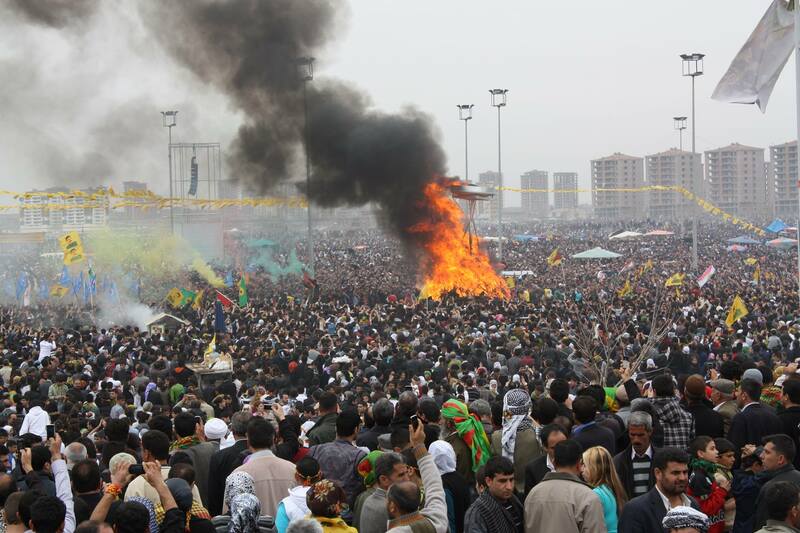 Newroz became a barometer for tensions between the Turkish State and the PKK31. In the last two decades, 1999-2004 and 2013-2015 were two peaceful periods, both marked by ceasefire. Between 2004 and 2012, relations between PKK and the capital were punctuated by numerous attacks, killing on both sides. In parallel, the arrival of Turkey’s Justice and Development Party (AKP) to power in 2002, and the opening of a government-run Kurdish language television station in 2009, were seen as a positive change in the Turkish political landscape. It allowed a better inclusion of Kurds in Turkey. Based on this analysis, what can we expect for tomorrow’s celebration? 2015 started full of hope, with a prosperous celebration of Newroz, when Öcalan “urged his militant group to hold a congress on laying down its weapons”36. However, PKK resumed its armed struggle in June last year, targeting Turkish soldiers and accusing the Turkish State of leading repressive activities against Kurdish armed groups fighting ISIS and in the Eastern part of the country. Tensions are high and are felt throughout the world: The US embassy warned its citizens in Turkey to stay clear from Newroz’ celebrations37. Friday, Kurds in Brussels were protesting against Turkey in massive numbers38. 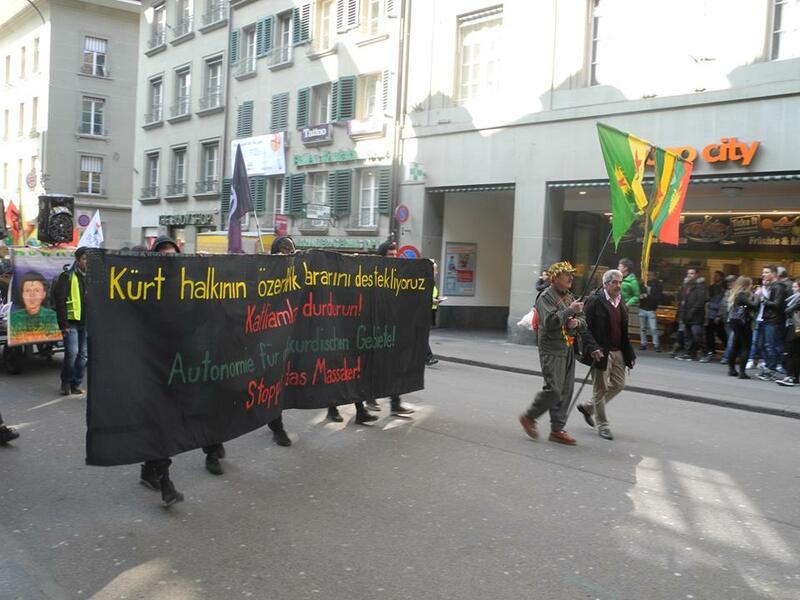 Saturday, Kurds in Bern gathered in the streets to denounce Erdogan’s actions. As the country is being thorned by cultural and political separatism, will Newroz celebration tomorrow be again a milestone in Turkish-Kurdish relations?